This is the project we show clients when we suggest they paint their doors black, though they usually look at us like we are crazy. 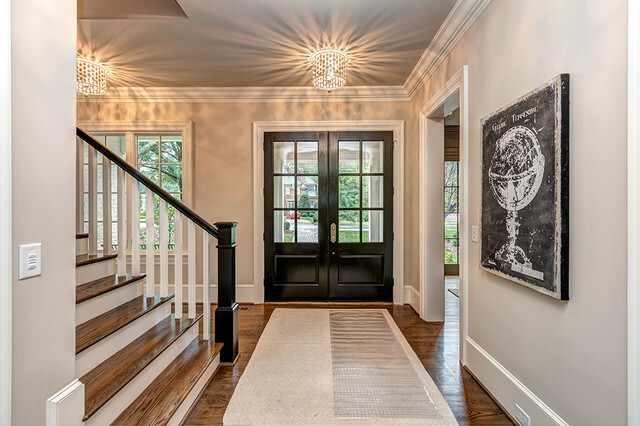 Then they see the result of this wonderful front foyer, and grab the paintbrush! 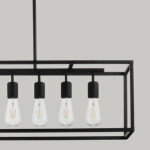 - This is such an elegant design! Can you tell me what color you used on the walls? 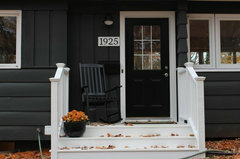 Completely agree...black front door is classic, we just installed our black front door. Looks so elegant. What shade of black is if? No I haven't decided yet for the office..any advice is appreciated! I did color the front door black and I love it! Kate, what’s the name of the black paint? - What are the black floors? Do you know what grout color you used between the floor tile? I would like to do something similar and would like the grout to blend with the tiles as much as possible. We used a dark charcoal grout. Not sure the exact shade, since there are many grout companies out there, and the exact info is not in the file. Grout comes in a limited number of colours, so it shouldn't be too tricky to find a shade that works with the tile you selected. - What is name of wall color and what finish of black? What would the equivalent jetblack color be at SW? I have no idea. Ask Sherwin Williams, they likely have the formula, even though it is a BenMoore colour. Ideal is to do a tester to be sure you like it in person. 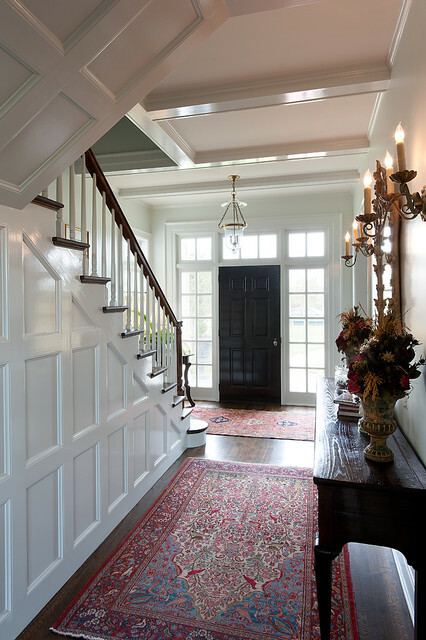 - Can you tell me the paint color used in the foyer area? Thanks! 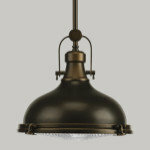 If you like this color, you would also like Benjamin Moore Prescott Green. - can you share where you found this door? stock or custom? thank you! I have the old 50's slab doors in my ranch home. Is this door on the left just trimmed with some sort of molding ? I don't really want to buy new doors if I can use the ones I already have. Yep, it is a flat slab door with a moulding applied! I went back in the file, and for this particular project, we used a paint from C2 called Architectural White. 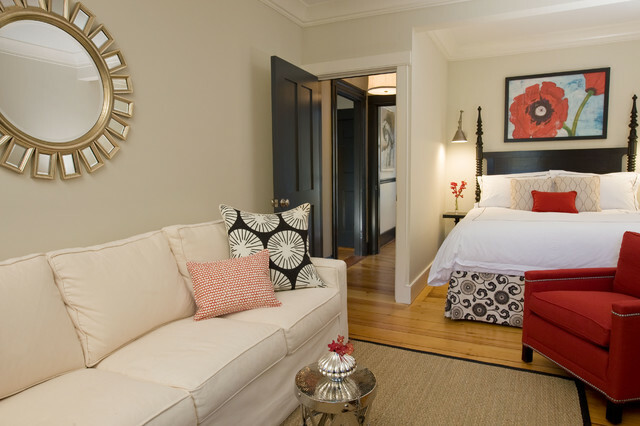 You may want to get samples of these whites (the C2 and the Benjamin Moore's) to compare in your own home, as you may like a softer, creamier white, or you may like a crisp, sharp white....hard to say without seeing them in person against your red! - Hi! 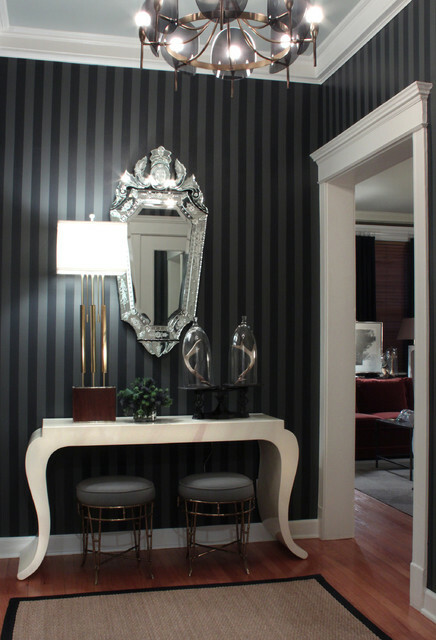 Love this look; doing the gray wall/white trim/black doors (throughout) in a house we are building my question is, I'm thinking about doing black window coverings, as well, instead of the white to match the trim. Which do you think will look best? I'm solidly on the fence, and you're clearly familiar with this look! Thank you. I have absolutely no idea! The door and window were in place when we were hired, we just painted the door. 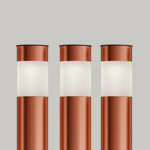 Ask a door company that does side lights they recommend for front doors, I am sure you can buy stronger glass. - What color black is on the doors? Is this sprayed or brushed on? Not sure, it was a few years ago. The contractor either sprayed the closet doors in his shop before installing them, or painted them with a foam roller. what colour did u paint the walls? The wall colour is by C2, and the colour is called Paper Clip. Love the closet door. Where is it from ? 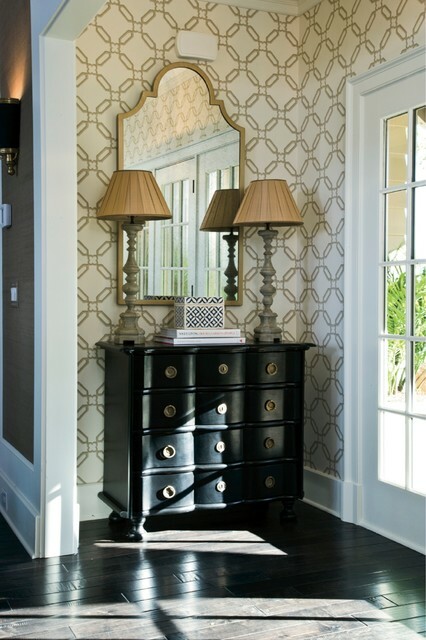 what are the details on the entryway tile? where is it from and how much? I'm sorry, but the tile details are not in the file. I presume it was a dark grey slate, 12x24, but that's all I remember. Sorry about that! - Foyer is open to living room, kitchen, white walls, white furniture, aqua accents. Pillows in LR, printed white and Aqua drapes in kitchen off white cupboards. Island stained brown. Can I paint front door Black or should I go with a shade of Aqua. Aqua is more informal. I’d stay with the dark, rich brown you already have. It looks warm and welcoming. Hi sholw, you will get more thoughtful and relevant responses to your question if you post a photo of the actual space you are referring to. This is a photo of one of my projects, so it makes responders think you are inquiring about THIS space. Try creating a new post, and take a photo or two of your home to get better replies. - Thanks so much for taking the time to answer so many questions. It makes a huge difference to understanding what you've done and to my,ind, it reveals how open you are about collaborating with people on projects. I wish I lived in Montreal. Do you do consultations electronically? Thanks so much for noticing, and for the wonderful compliment! While I do not normally offer e-design services, (I have enough on my plate with my in-person work) why don't you message me privately (hit the "contact me" button on my profile page) and give me a sense of what you need done? Who knows, I may be able to take this on, or can perhaps steer you in a direction to get the ball rolling! 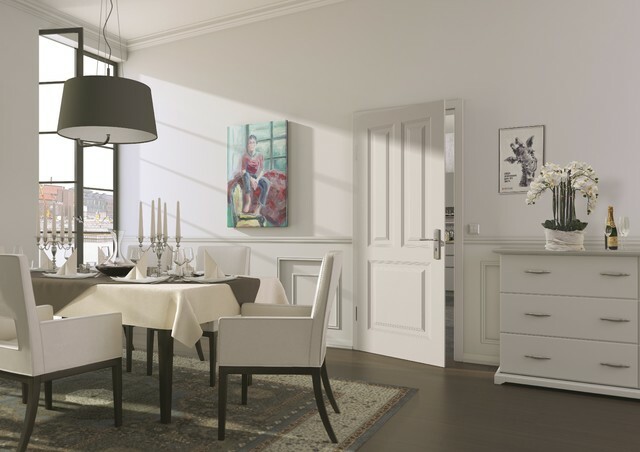 If you need Solid, Contemporary, Fiberglass, White Primed, French, Interior, Entry, Barn or Traditional doors, go to http://www.etodoors.com or call (888)Door ETO. where can I purchase this lovely console table? Thanks for the question! Unfortunately, that information is not in the file. This project was completed several years ago, and the purchase would have been made at a retail store in Ottawa, Ontario. You could always show the photo to a cabinetmaker and have it custom made? - What tile is that by the front door? Does the window glass have a treatment on it? - I want some privacy but would like to have the light. I do not want curtains. 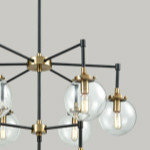 I just sent this link to another Houzzer who had a similar request....this company sells at various retailers throughout North America (and through Home Depot in Canada). If you scroll through the slide show, the last one, called "Rice paper" is a close match to the effect on these windows. A roll is less than $50, and is easily applied, and also easily removed in case you change your mind. Should the grilles in a black door be black? - Ordering a front door with window grilles . Ordering the door painted black. Should I also get black grilles? Should I paint front door same color as porch furniture? You will get more relevant responses if you post this question with a picture of your own front porch. Is this a semi gloss paint? No, this is a satin finish. This is a textured frosted glass that was already in place when we met the homeowner, so I can not give any specifics on it. Sorry about that! - I want to paint my garden doors black and they cannot be taken off to spray paint. Would you suggest what type of roller to use (foam). Thanks in advance. You can try a good quality foam roller, to eliminate brush marks, but I suggest you ask at a paint store if they can suggest something specific for you! - What color are the doors painted? 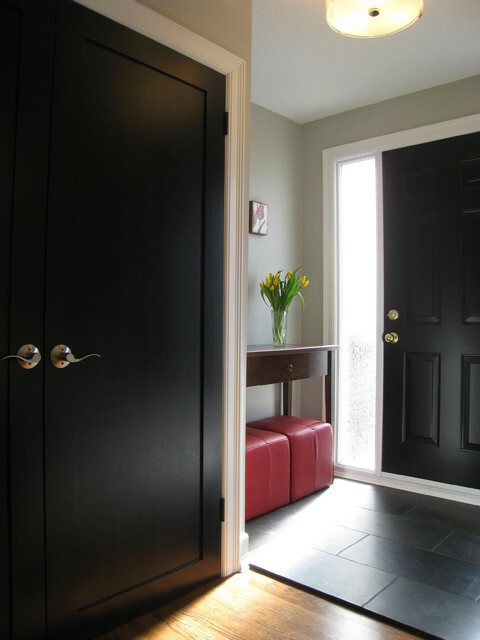 These doors were done in Benjamin Moore's Jet Black. Finish is satin. - What type of paint finish was used...matte, eggshell, etc? These doors were done in a satin finish. - Could you please let me know the dimensions of this entryway? Is that the dimension you were looking for? - I know there is a little tag but having my "mouse" hover only brings up all the icons an I can't access the info. Floor material? It looks like it is on top of the wood floor; is that correct? Who makes it? It is a 12x24 slate tile, in a charcoal grey, and no, it was not installed on top of the hardwood. The subfloor happened to be at the same level as the hardwood, so the client was okay with the slight height difference. - Are the door hinges painted on the same finish as the door knobs? What an eagle eye you have! If I remember correctly, these were picked up at Home Sense in Ottawa, Ontario, but this was several years ago. Your best bet is to search the Houzz photos, enter the keywords "floating wall desk or table" and see what comes up. Lots of floating shelves out there, but not sure about tables and desks, as that needs to be very well anchored into the wall. You may be best to hire a cabinetmaker in your area and have one made and installed for you. Is different color on the interior doors on one side ok? 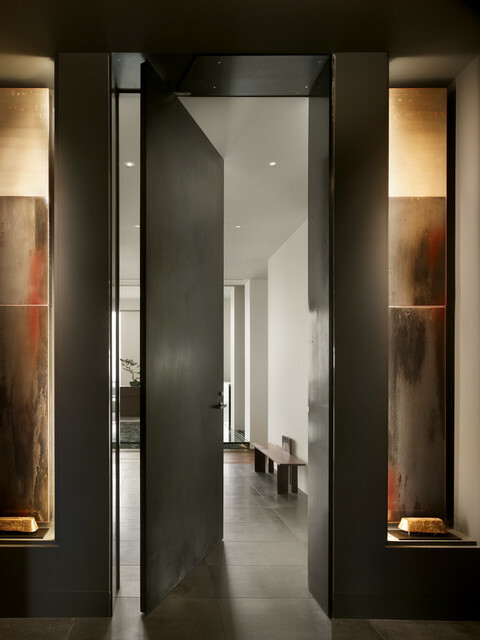 - I just want the look in the hallways and entry way. Absolutely okay! In fact, this door is a shade of purple on the outside! What is the painting process for an PVC front door? - I have a single white door with 2 side panels. Each have a narrow window. I want to freshen up the look from the inside but should I also paint the outside? Is it possible to do this myself and have a good quality result or should I hire a professional and how much should I expect to pay if I hire someone? 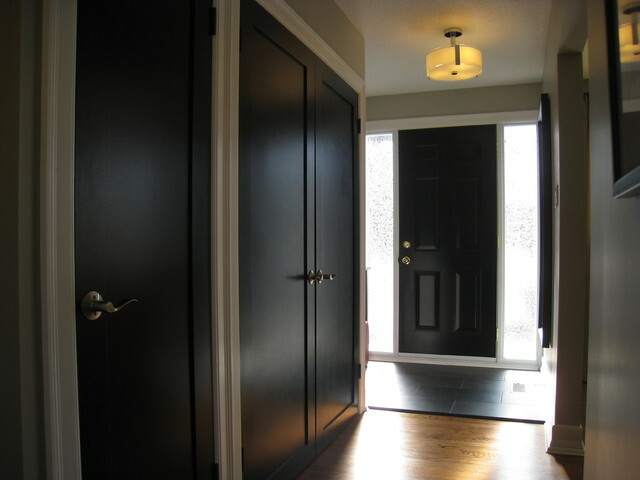 This door was actually painted a different colour on the exterior, as the black would not have worked with the exterior finishes on the house. It's up to you if you want to paint both sides of a door, though be sure you do so during nice weather, when the door can be left ajar for the paint to dry properly. 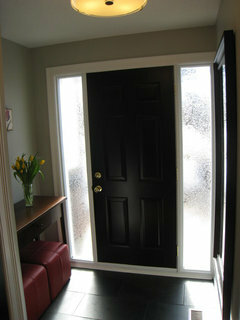 In this case, the narrow edges of the door were also painted black. You can certainly tackle the job yourself, if you are a good painter, but please ask at your local paint store about the proper preparation for your door, as you will likely need a special primer and/or special paint for this type of material so it adheres properly. You may also require a particular brush or foam roller to avoid brush marks. Can you paint PDF doors black or does it have to be wood? These particular closet doors are actually done in MDF. The front door is steel. You can paint pretty much anything these days, it is just a matter of getting the right formulation of paint. Be sure to tell your paint supplier what you plan to paint, and they will advise on proper surface preparation so you get the best outcome! Can the door hardware be shiny brass or should it be changed to antique brass? In this case, the homeowner kept the exterior door handle as is (for now) which is a shiny brass. They will eventually change it to satin nickel, like the closet doors, but truly, there is no hard and fast rule! Go with what you love! If I had to choose a brass, I prefer the warm undertones of an antique brass vs the shiny brass, but that is also a personal preference. What kind of paint would you suggest for doors so they don't "stick" to the door frame? Thank you! Painting is a tricky process, especially with doors. For exterior doors, paint on a gorgeous day, so the door can stay in the open position as long as possible, and pay attention to the paint manufacturer's recommendations on what temperature to paint at, as the time of year when weather dips below freezing is not a great time to paint. Also, make sure you prep the door with the proper primer and use the right PAINT for the door! Different paints are formulated for different surfaces, so ask for advice at your paint shop for the best type of paint to use, as well as what type of primer. You may likely need to sand the door beforehand so the paint and primer have better adhesion, but again, depends on whether you are painting wood, metal, time of year, oil vs latex, etc. - I have several shades of grey and have been loving it. Our church recently changed the sanctuary to grey, and it feels much more cozy, but a little too dark for my small home. I have the dark laminate wood floors and think this grey would be great for my living area. Would u mind sharing the color on the wall and thoughts on making a small area appear larger? Black on the outside of the front door? - I read in one of your answers that the black wouldn't work on the outside of this home. What was the color of the house on the outside? I want to paint my doors black but I'm second guessing the outside now because the siding is a dark gray. I am not sure if that would be too dark. Also the porch is only 5 feet long so very small for the front door. Would that seem too dark? I am also planning on painting the interior doors all black. The house is one level. I can't remember the colour of the outside of this house, as the project was a few years ago, however I do remember that we selected to paint the street side of this front door in a deep plum/purple hue. 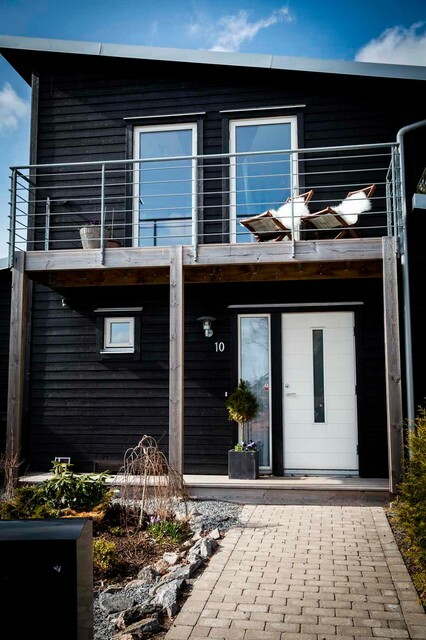 If you post a photo of the front of your house in the "design dilemmas" section of the Discussions, I am sure you'll get some feedback on whether black on your front door would be the right colour. I am a huge fan of black doors, so regardless of the outside of your home, black doors can be a fantastic look on the inside of most homes! 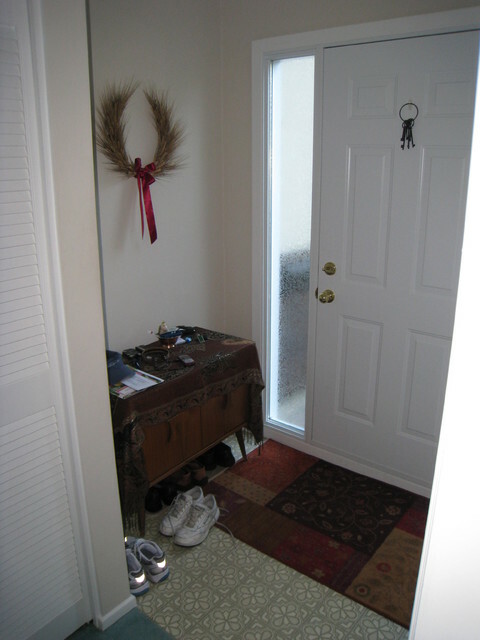 the upstairs doors can be seen from my foyer, do i have to paint those doors as well? In this particular house, we only did the back of the front door and the closet doors. 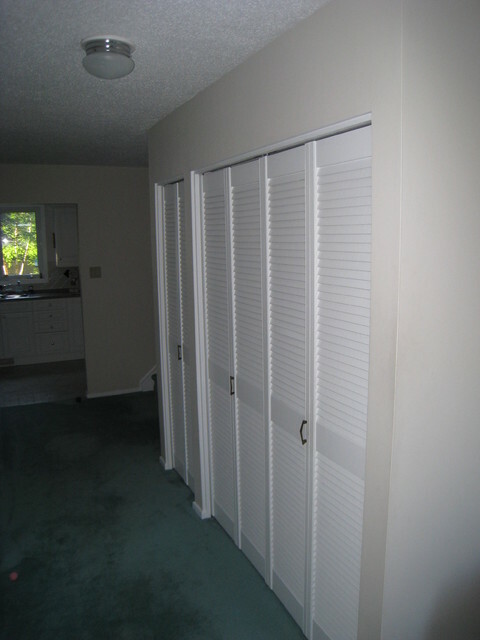 The home is a split level, so other doors were still visible, and we decided to keep them white. Alternatively, we have had clients paint only french doors (glass doors) in black, and leave all other solid doors in white. This way, the eye sees through the glass in the door, since black kind of "disappears", and actually makes the door less noticeable. With black doors, I would start small, say just the inside of the front door, and see whether you love it. 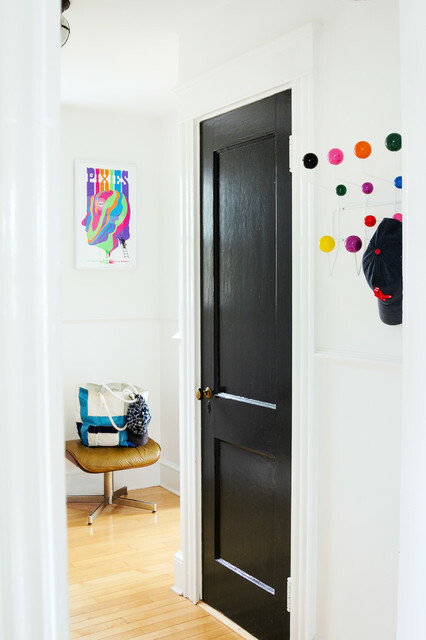 Many clients have tried this, and they end up leaving just the front door like that, or they go for the whole enchilada and paint every door in the house! 3. They’re good at making things disappear. Got a door you want to downplay? 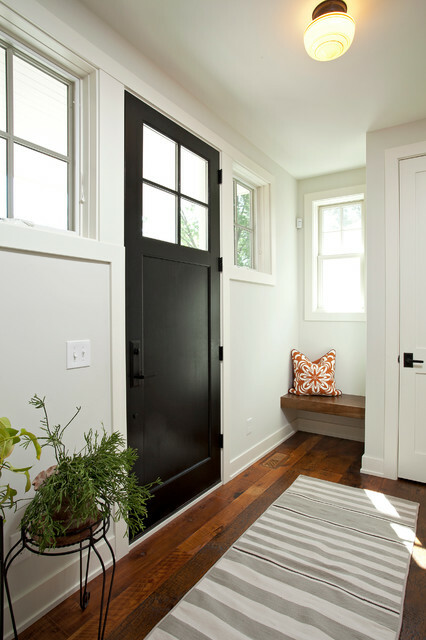 Black is great at disguising shortcomings (like a large slab door, if that’s not your style) so you don’t notice them.Black doors work well in an open space like this, but avoid using them in a confined area with a confluence of doorways, as they can look chaotic.